I posted this over at Misty's Words, but I'm very excited about it, so I am posting it here too! You all know that I absolutely love books. I'm addicted to books. Seriously - it's an addiction. I also love to write, although I haven't devoted much time to writing lately, as my focus has been more on photography. Anyway, let me get to the point (See, I ramble too). A few years ago, my dad showed up with a hardback book and said "Mist, you just HAVE to read this." I must admit my response was less than excited, because I honestly didn't think this was 'my type of book'. I couldn't have been more wrong! As I read this book, the characters became real to me. I felt their emotions. I felt anticipation; I laughed out loud; and I cried. After reading this book, I immediately bought the next two books of the series. Again, subsequently, when they were published, I immediately purchased the next two books of the series. Now, I eagerly try to be patient as I wait for the sixth book of the series to be published. The series is called The Wilderness Series. The author is Sara Donati. Sara Donati is a pen name for The Wilderness Series. Her real name is Rosina Lippi, and she has also published books under her real name. One of which, Tied To The Tracks, is another of my favorite books ever. If you are coming to the conclusion that Rosina Lippi/Sara Donati is my favorite author, you are completely right. Her words and her characters... I just can't even choose the right words to express how fantastic, inspiring - REAL. I have even reacted out loud while reading her books, which is something no other author has ever evoked from me. Anyway, why am I speechless, you ask? Well, yesterday, I received a comment on this post, which is all about my overseeing the birth of calves and, subsequently, naming them all after characters in the Wilderness Series or friends from the forum, which Rosina had created for us. The comment was from Rosina! My favorite author! Yes, I have communicated with her before, through the forum I mentioned, but this is different. That was her forum, which she designed for her readers. This is my blog; my words; my thoughts, and she, a woman whom inspires me and is one of my idols (for lack of a better word), took the time to come to MY blog! I just can't express to you what that means to me! Now, you MUST go directly to your local bookstore or library. 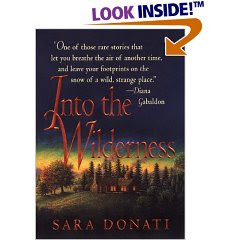 Get a copy of Into the Wilderness, by Sara Donati, in your possession and start reading. You will NOT be disappointed. You will be coming here to thank me for the recommendation. Also, on Valentines Day, Rosina Lippi's new book will be released. It is titled The Pajama Girls of Lambert Square, and I am excitedly looking forward to reading it! Here is the link to all of the books in The Wilderness Series, because, trust me, if you do as I say and read the first book, you will immediately want to read the rest of the series. Also, here is the link to Rosina/Sara's weblog, which isn't just about her published books, it is also about the craft of writing, recommended readings, and more. That is so COOL!!!!! You ROCK girl! I am very much looking forward to her new book! Oh wow, that is way cool!!!!! I LOVE books too. As soon as I finish one book, I'm picking up the next one. I'll have to check this series out. OMG, that is the coolest thing ever. I'll have to check her books out. Thanks for the tip. Guess what? I ordered the book and just got it in the mail. Looks like something I will love.